Lisa Schroeder's I Heart You, You Haunt Me is exactly why I need to have a 'novels in verse' section in my classroom library. I have a list of girls who don't consider themselves readers that would flip for this book, then eagerly devour everything similar on the shelf. There are so many appealing aspects of this book--the romance, the great cover, the supernatural, the easy writing style--that I can confidently say it is a book that will create readers. At fifteen, Ava's boyfriend Jackson has died and she feels responsible for his death. Mourning in her home, she begins to feel cold air and see flashes of Jackson in the mirror. Finally, Ava feels alive again and delights in spending time alone and dreaming of her love. Everyone else is concerned about her and tries to get her to see that maybe her self-imposed isolation is no life at all. While this could be the book for some of my students, I didn't adore it completely. I found it highly readable (and read it in about an hour) and will enjoy recommending it, but it doesn't stand up to the best novels in verse that I have explored lately (I know, "Shut up about Sonya Sones, Miss K!") The sticky part for me was the unhealthy feeling of Ava and Jackson's relationship. The only was he can express displeasure is by trashing her room and slamming doors, usually to make her feel guilty for leaving the house. It felt emotionally abusive and wasn't addressed as much as I would have liked. I also wanted more character development; as I closed the novel, I felt like I really didn't know any of them. 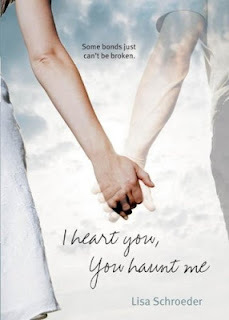 Despite these complaints, I enjoyed I Heart You, You Haunt Me, and am glad that I ordered all of Lisa Schroeder's other novels in verse from my library. This was the first novel in verse that I ever read. At first, although I enjoyed it, I came away with the same feeling that you did - that I didn't get to know the characters as well as I would have liked to. But, I think that has more to do with the length of the book and that it is such a quick read. (Her others are all longer.) Can't wait to read the rest of your reviews. The cover for her new book, Falling Into You, was just released. I will definitely be checking that out as soon as it's published. I am eager to hear what you think of Sones' books!